A family member has just suffered a condition that could eventually require round-the-clock care. Of course you want to be the one giving that care. This decision is usually made without hesitation; of course we want to be our loved one’s caregiver. Who else could take better care of them? However, when the reality of your decision sinks in, your head will be swimming with uncertainty, anxiety, and maybe even fear. Certainly you will have many questions. First of all, arm yourself with knowledge. Knowledge will empower you to take the best care of your loved one and yourself. Learn all that you can about your loved one’s condition. Speak with the doctors, nurses, social workers, support groups and anyone else that can provide you the information you need to understand your loved one’s condition and what the future may hold for both of you. When you learn all that you can, you will be more confident in your caregiving abilities. 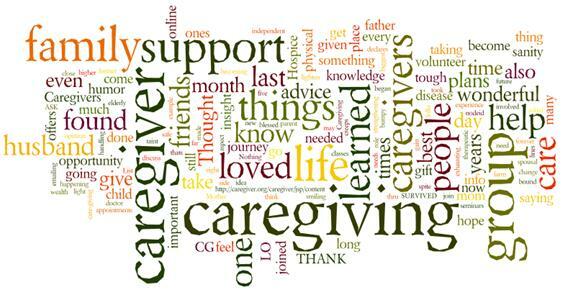 Caregiving can be an isolating experience, so it’s helpful to talk to others who are, or have been, in your shoes. You will feel that you are a part of a growing community of caregivers. You may also learn about options and community resources that you were not aware of from other caregivers. These people can also help with difficult decisions concerning your loved one. Determining your responsibilities will probably be one of the first things you struggle with, so talk to others who’ve been there before. Caregiving need not be a lonely and emotionally debilitating experience. According to the latest statistics on caregiving for the National Family Caregivers Association, nearly half of the U. S. population has a chronic condition. From that number 41 million are limited in their daily activities while 12 million are unable to live independently or even leave the house. So keep in mind that you are not alone!! !